What is Biomass, or more importantly what is the definition of “biomass”. Every tree, crop and living plant that grows on the planet Earth has energy inside it, and bioenergy is the generalised term used for all living matter that has the ability of storing this energy. As with most living things, energy is stored in the form of carbohydrates, including celluloses, starches and sugars, that are produced as part of the process of photosynthesis. The process of photosynthesis enables green plants to capture the electromagnetic radiation from the sun and transform it into chemical energy, with the biomass energy obtained by reversing this photosynthesis process. The stored energy within the living matter is released when the chemical compounds within the organic materials are broken down due to decomposition. The organic residues left over from this process being called biomass. Then biomass uses plants as sources of energy with the term “Biomass” in its broadest sense being used to describe organic matter produced by living organisms and therefore, biomass sources can potentially comprise of a wide variety of different natural materials from liquids to solids to gas. Biomass energy is very advantageous because it can be produced from a total natural process and source and is therefore regarded as a “green”, and climate-friendly form of energy making biomass energy a renewable energy resource compared to fossil fuels. There are a lot of ways that energy can be made. The burning of fossil fuels, the utilisation of the sunshine to generate solar energy or by making use of the flow of water for hydroelectric generators, all these are ways of creating energy. Even the Earth’s core can be used to produce geothermal energy. However today, biomass is quickly becoming the largest growing source of renewable energy around the world and it continuous to grow, helping us reduce our consumption of fossil fuels and extending the life of our planet. Biomass materials and other forms of renewable energy materials aim to be carbon negative or at the very least carbon neutral. Carbon neutral means that the carbon released during the use of the fuel is reabsorbed and balanced by the carbon absorbed by new plant growth during photosynthesis. The biomass crops are then harvested to make the next batch of fuel, thus maintaining the cycle of carbon within the Earth and its atmosphere without adding to the problem. Although the environmental impacts of burning biomass are less harmful than those associated with fossil fuel coal, it can be more harmful than those associated with burning natural gas. 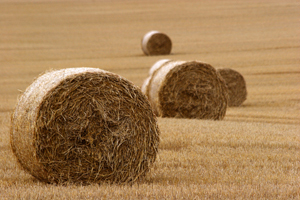 But what is biomass material and what types of biomass crops can be used? The most common example of biomass is that of wood, but we have said previously that biomass can be made out of all the natural things, and this is true. Starting from agricultural and forestry products, some of the energy crops grown around the world include trees, plants, wood, grasses, animal wastes and slurries, with just about any plant or animal you can think of in between being used to produce biomass crops. As humans are an integral part of the systems that make life, even the waste from human beings can be a source of biomass as well as the rubbish we throw away, all these things can be used to produce biomass and bioenergy. Biomass can be used in solid form, but the advantages of biomass is that through a wide range of conversion and refining processes, it can be made into both liquids or gases. These biomass solids, liquids and gases can then be used to produce electrical power, heat, new chemicals, and even combustible liquid fuels. There are several ways in which biomass materials can be used as a usable energy source. One is through combustion or the burning of solid biomass such as biomass pellets to create heat, in fact using wood as a fuel is one of the earliest forms of biomass uses. Direct combustion technology is very similar to that used for coal just like in a coal-fired power plant for generating electricity, with the handling and burning of the solid biomass and coal being virtually the same. Another way is to extract the oils from the organic sources of sunflower, rapeseed, maize and corn just like extracting a vegetable oil, or from the unused portions of crops grown for other purposes such as the chaff, stalks, shells, husks, and roots. The oils collected can then be processed and refined for use as a liquid biofuel in diesel engines. One promising source of liquid biofuel is micro-algae, which can be grown on aquaculture farms. In addition, various alcohols can also be extracted to provide ethanol fuel for gasoline engines. Another way in which biomass gets put to use as an energy source is through recycling biodegradable materials in landfills. Landfill gases are by-products of both solid waste and liquid wastes which contain significant amounts of organic materials that produce a variety of gaseous products when dumped, compacted, and covered in municipal landfills. Wet biomass materials can be converted effectively into usable energy using anaerobic microbes. Anaerobic bacteria and algae thrive best in the oxygen-free environment, resulting in the decomposition of the organic materials and the production of biogases such as carbon dioxide and methane. As carbon dioxide is soluble in water, it sinks deeper into the ground out of harms way. Whereas methane, (the principal component of natural gas) on the other hand, which is less soluble in water and much lighter than air makes its way to the top of the heap and gas collection facilities capture this methane and burn it as a bioenergy fuel. We have seen that Biomass Energy production involves converting biological materials or wastes into substances that can be used as a fuel for heating, transportation and power generation. There are many advantages of biomass energy, one of the key ones being the fact that it is carbon neutral, but carbon based materials that have been converted over time into fossil fuels such as coal and oil, are not considered “biomass”, although in their original states they could have been. There are many different types of biomass energy and biomass fuel sources available with many of the biomass, bioenergy and biofuels related terms that are bandied about used as though they all mean the same thing. generally speaking, biomass is the organic non-fossil material of biological origin which can be used as a renewable energy source. Bioenergy is the final energy product or useful energy that has been converted and made available from biomass. While biofuels are liquid or gaseous fuels of biomass origin. Plants grow continuously, animals constantly produce manure, and people throw away waste material all the time. Using these items for fuel does not deplete them because they are always being made. For this reason, many experts believe that bioenergy will be a major source of power in the future. But note that the use of the prefix “bio” suggests a positive connotation, but biofuels may also be derived from the non-sustainable cultivation of energy crops. To learn more about “Biomass”, or to understand what is biomass and the various types of biomass crops you can use to convert into fuels, chemicals and power, or just to explore the advantages and disadvantages of biomass energy, then Click Here to get your copy of one of the top books on Biomass Energy direct from Amazon today. It can be a smelly pastime but get past that and biogas is really quite an exciting prospect. I have been involved in the gas industry for 30 years and got into biogas through working on waste sites. The sites we look after at the moment use boilers which run on biogas to heat the digester’s to make the bacteria break down the waste quicker which in turn makes more gas so it is completely self sufficient. The only problem being if the boilers or plant break down and the digester goes cold and kills all the bacteria you have to introduce new bacteria which i understand is quite expensive. The biogas produced is rather wet and as such can require more maintenance. The prospect of more farms introducing bio digester’s is also a good step in the right direction but as usual we are miles behind Europe. whirlston pellet mill machine.Unique perspective. My thanks for posting this. I will definitely return back to find out more and tell my acquaintances about it.